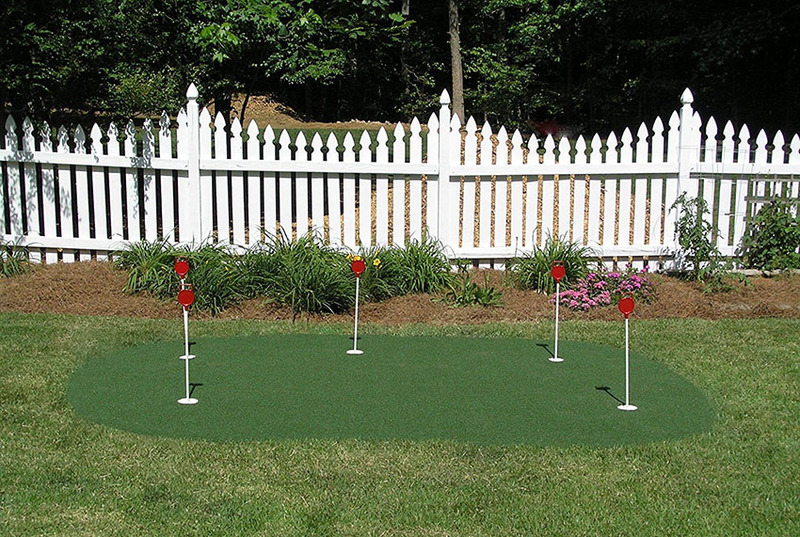 A golf backyard putting green is a great way to practice the sport from the comfort of your own home. A putting green can be constructed in your backyard that will provide hours of enjoyment as well as increase your house’s resale value. 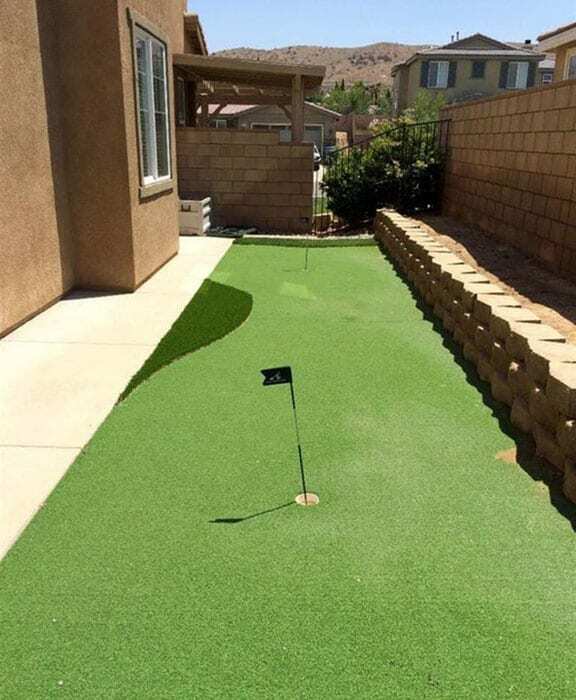 On this page you’ll find pictures of backyard putting green designs to give you inspiration for creating your own space to play golf from home. Golfers looking to have some practice putting greens installed in the backyard may also still want beautiful aesthetics for their landscaping. Allotting some space for the putting green might seem that it leaves you little space for design creativity, but using the little space you have left over – like in the example above that uses bright flower beds located right next to the greens – is one of the key points of good design. When considering the type of materials needed for creating your own backyard putting green there are generally two choices. The choices are natural grass or synthetic turf. Most experts don’t recommend natural grass for golfers due to the time commitment of maintenance and upkeep. However, natural sod can be much less expensive than synthetic turf. You can find sod that you install yourself for around .50 a ft. Another downside is if you live in an area with many colder months it may require you regrowing grass every year. Not to mention you will be limited in the times of the year when you can use it for gold putting. On the other hand, synthetic turf is durable, long lasting and requires no daily maintenance. Synthetic turf offers you year round use by not being effected by extremes in hot or cold weather. The convenience factor is one of the main selling points of choosing synthetic turf. The cost for synthetic grass can run from around $5 a ft on up to $25 depending on the quality you select and whether you will be installing the turf yourself. 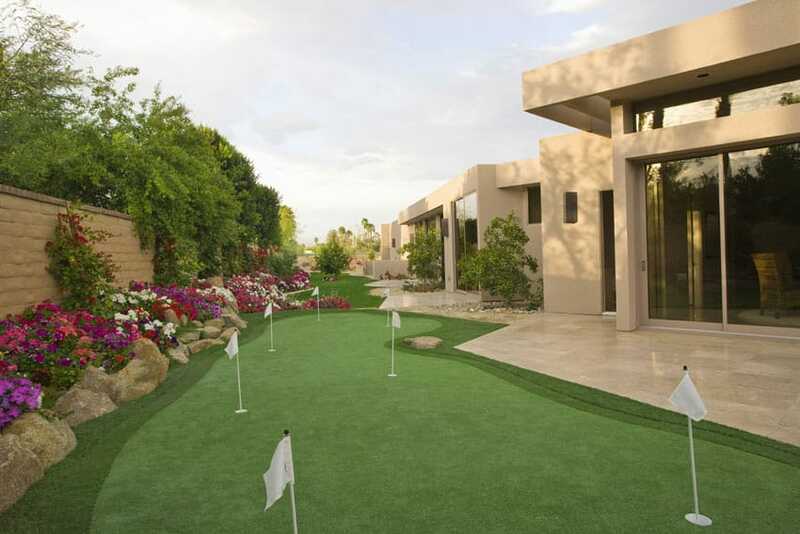 Avid golfers and hobbyists are sure to love their very own putting green turf in their backyard. 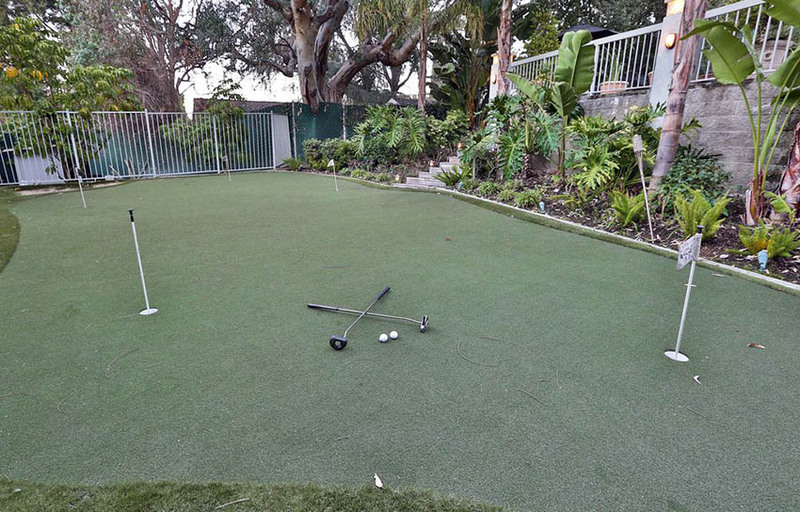 A personal putting green makes it immensely easier to practice putting during lazy Sundays at home or whenever the sun is out and there’s spare time to kill. 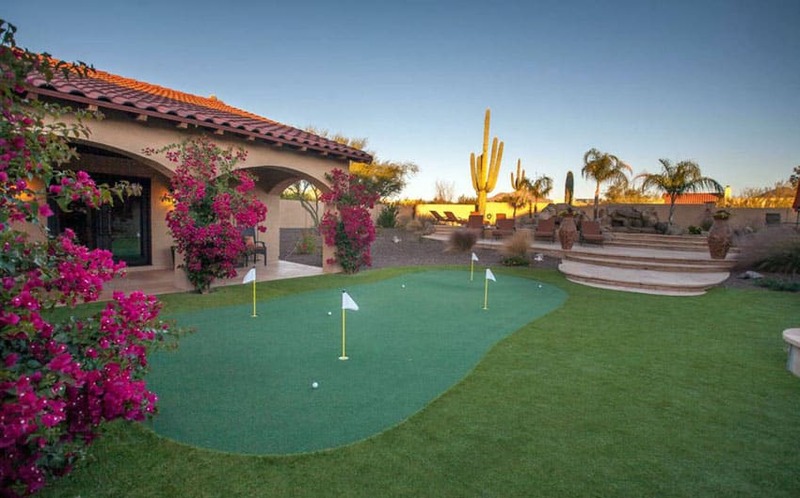 Using the appropriate tools and construction materials, building up a personal putting green to incorporate into your backyard’s landscaping will be fairly straight-forward and even fun. The first step is to lay the base materials. This is an important part of the build since it helps stabilize the earth which is important especially for less than stellar ground conditions (e.g. flood prone backyards). The finer the grain size of the gravel, the better it will be for stabilization. Using a plate compactor, compact the laid out gravel; this shouldn’t more than an hour or so. The second step is to add the geo-textile fabric covering. This is rolled over the entire gravel bed to stabilize the green as well as to prevent any unwanted weeds from sprouting into the panels. The third step is to install the pre-cut designer green panels. This is a matter of following the instructions with regards to laying out all the parts. This part is a little bit like assembling a large puzzle, albeit a lot more forceful. Full-length screws are placed around the perimeter edge to secure the assembly. Apply some stone dust or fine gravel to the outer edge and compact them for an even firmer outer edge. Clean and prep the panels for the turf installation. Applying the turf comes fourth and this comes with the main turf roll and the fringe turfs. After unrolling the main turf, give it some time to rest under the sun to eliminate any wrinkles and kinks. Lay it on top of the panels, install the pre-made cups (holes) and then stretch and secure the turf to the panels with a pneumatic staple gun. Apply the turf fringes up against the putting curve edges and secured with the staple gun – be sure to have a good fit especially along the seams. Use a carpet steam roller to make the stapling less evident and then roll the edge of the turf over the edge of the panels and staple them in. After that, it’s a matter of clean up and final landscaping works and then it’s ready to use the new outdoor putting green. This amazing backyard features a putting green next to a large outdoor kitchen with wood pergola and a sparkling swimming pool and hot tub. 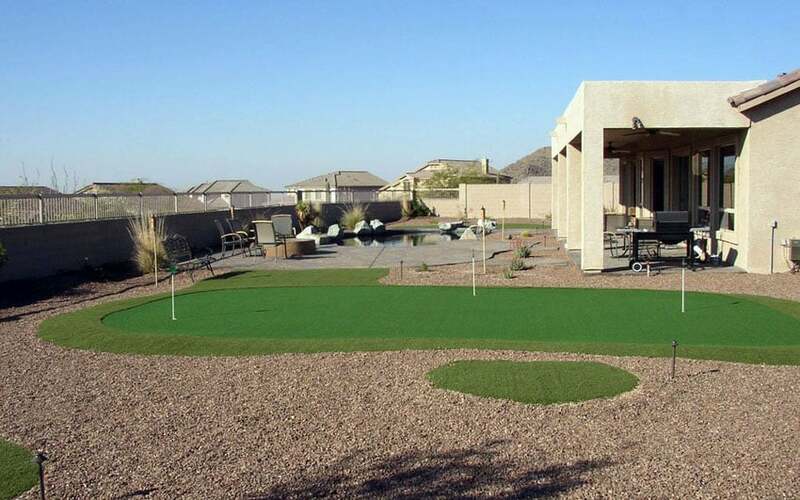 This four-hole backyard putting green has a very simple symmetrical layout for optimal putting practice and leisure playing. The side of the turf has a makeshift mini sand trap, a creative choice that helps hold any unused spare balls in place without fear of them rolling away. This view of the putting green shows its placement on a higher ground from the rest of the surrounding neighboring backyards. A long stone bench is built into one of the edges of the putting green for lounging on. A good view also greatly enhances the backyard putting experience. This tropical inspired backyard putting green lets night-time play possible with intelligently placed flood lights. 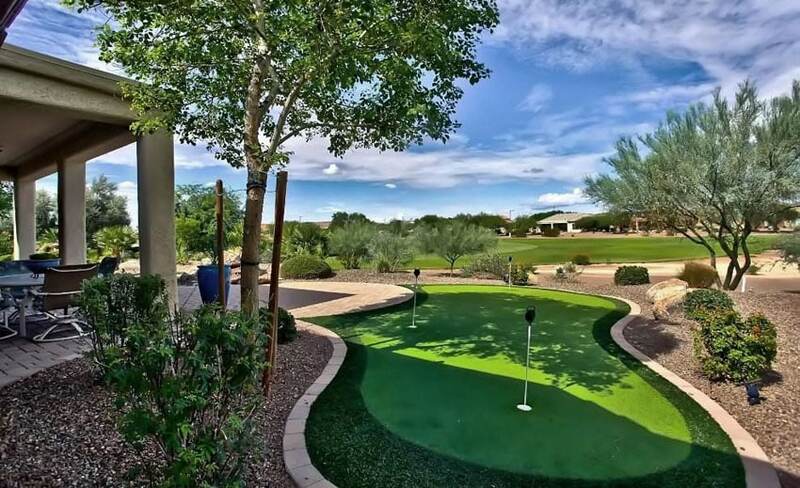 The tropical palm trees and creative landscaping not only makes for an interesting putting course but also enhances the overall backyard of this luxury home. 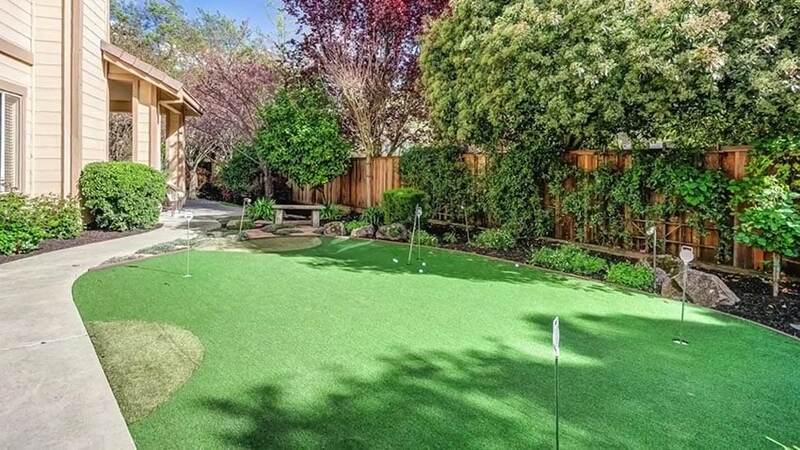 A clear aerial view of this simple yet effective two-hole backyard putting green shows that you don’t have to have a wildly eclectic design to have an effective backyard green. Incorporating such a straight-forward design maximizes the space and keeps installation costs and labor relatively low. 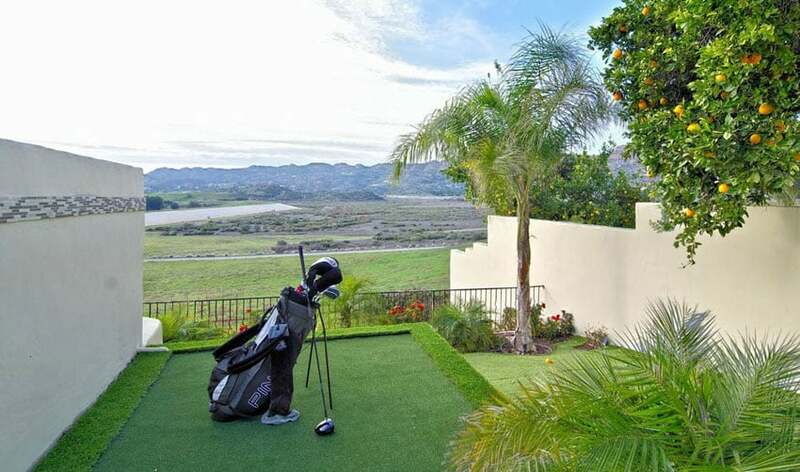 Expansive backyard views such as the one in this backyard putting green not only lends a uniquely beautiful view for the backyard golfer, but also makes it so that the backdrop can serve as a long driving range. Short and long games can be practiced in this kind of set up. 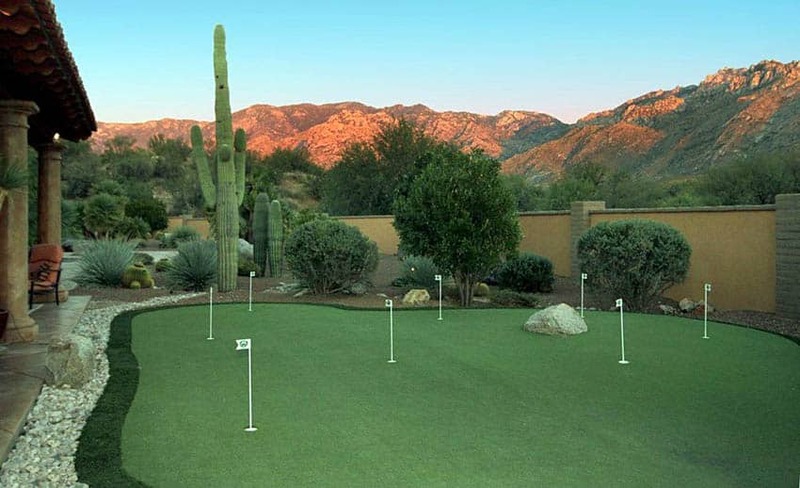 This backyard putting green offers a desert landscape and spectacular views of the nearby mountain range. This outdoor putting green is incorporated into a public park and is well integrated into the park’s large open grass field. Public activity and communal interaction is encouraged in this type of landscaping design. A more homey example of a home putting green, the cedar fences with climbing vines all over, the clean treatment of the landscape bushes, as well as the numerous trees from within the yard as well as from outside the fence, really creates a quaint natural ambiance in this backyard design. Not all putting greens are made large and sprawling – little ones such as this one are simple but serve their purpose well. 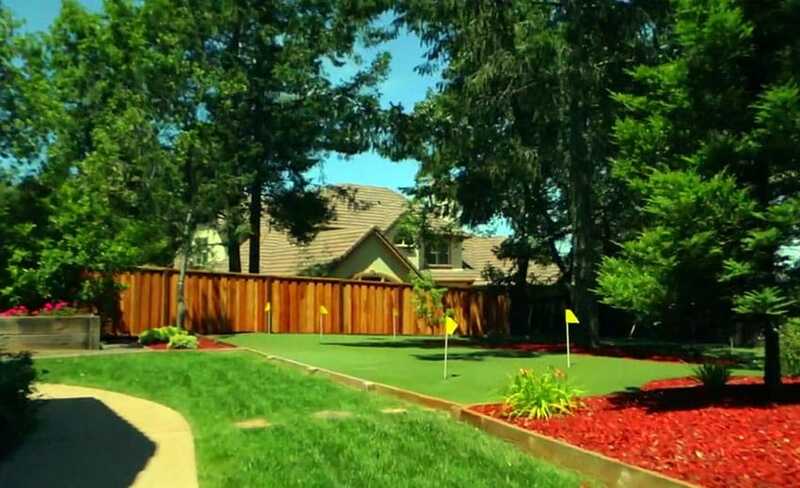 These types of backyard putting greens are ideal for small backyards or golfers that don’t want too much from their home putting greens. 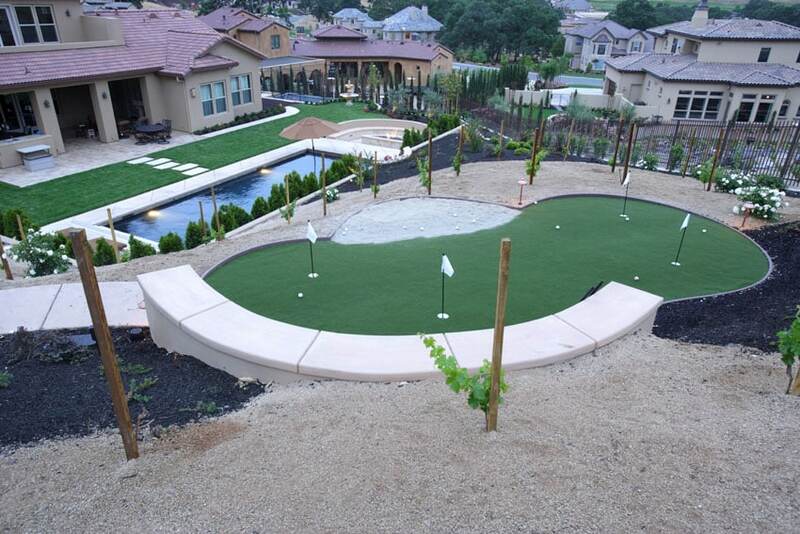 This backyard putting green is sandwiched between two amazing landscaping elements – a backyard swimming pool for the family and a small rock and bush garden to the back of the yard. A variety of activities and choices await the homeowners with this type of layout and landscape design. Lack of any softscape or soil surfaces shouldn’t stop any designer from building up an outdoor putting green. In this example, despite the clear lack of any grass cover, turf was set up smack dab in the middle of the outdoor stone tile flooring. The clear contrast between the turf and the hardscape tiles creates a very nice design aesthetic. Clear cut boundaries can be used to separate putting greens from the rest of the yard. 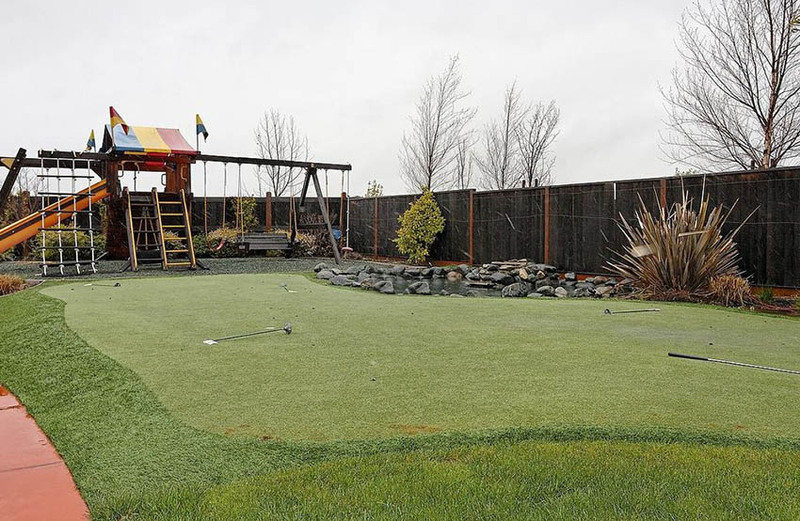 In this example, small wooden retaining walls were used to separate the backyard putting green and its artificial turf covering from the tree and grass parts of the yard. 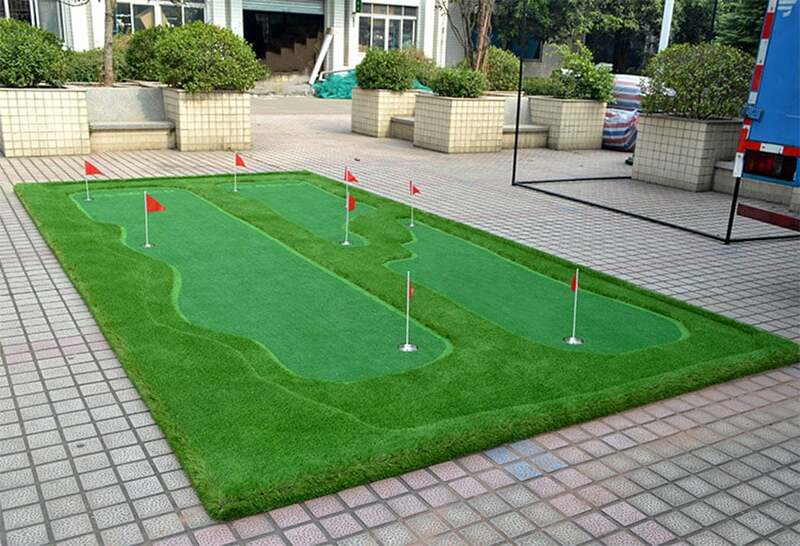 This interesting putting green design features real grass surrounding the fake turf of the green. In addition to the real grass there’s a rock water feature pond with small fountain to provide some natural ambience. 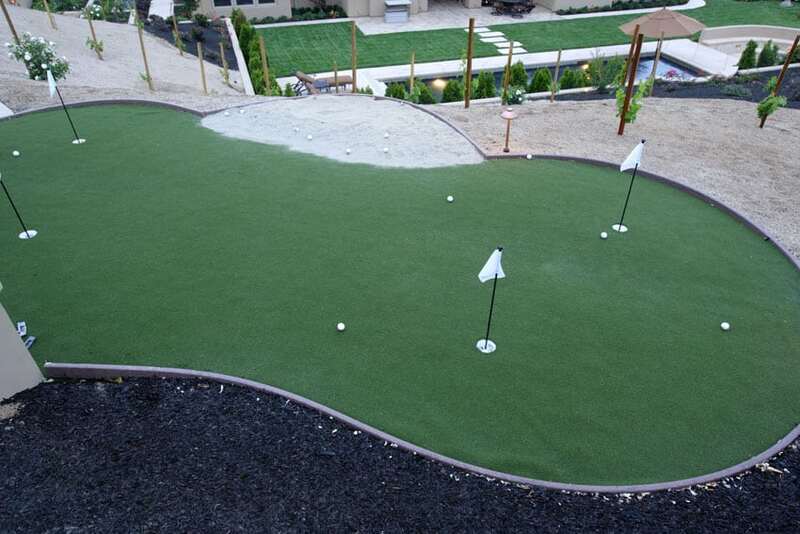 This artificial turf putting green setup is cozily nestled within surrounding landscaping bushes and trees. Large embedded rocks encircle the edges of the green as well as beneath the foot path that leads into the turfed area. 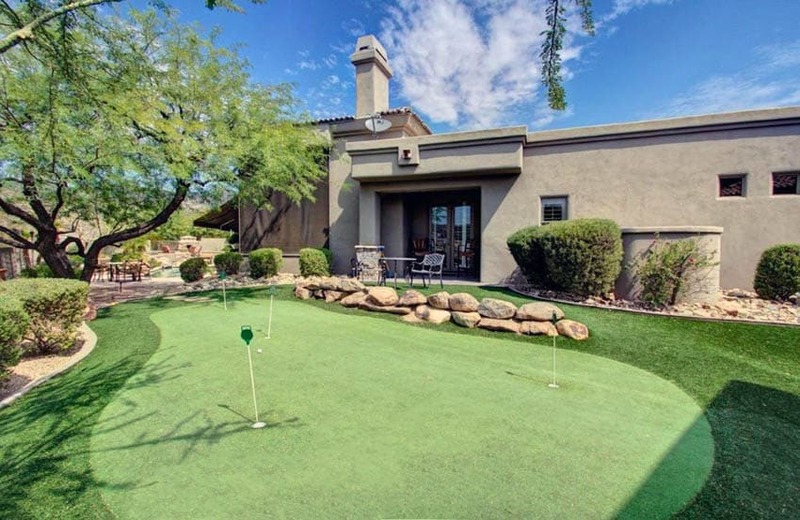 This creates a very cozy private putting area perfect for more private home golfers that might appreciate the seclusion. 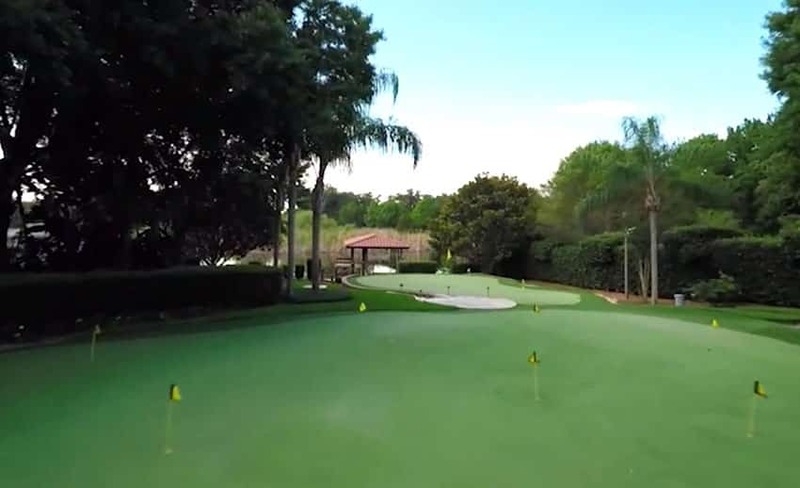 Open backyard putting greens are a clear popular choice when it comes to home gold practice landscaping. Putting it right between the surround edge flower bed and the hardscaped surface of the backyard makes smart use of the space. In this example, the putting green is also located next to the home’s swimming pool and can be seen from the house’s second floor balcony. 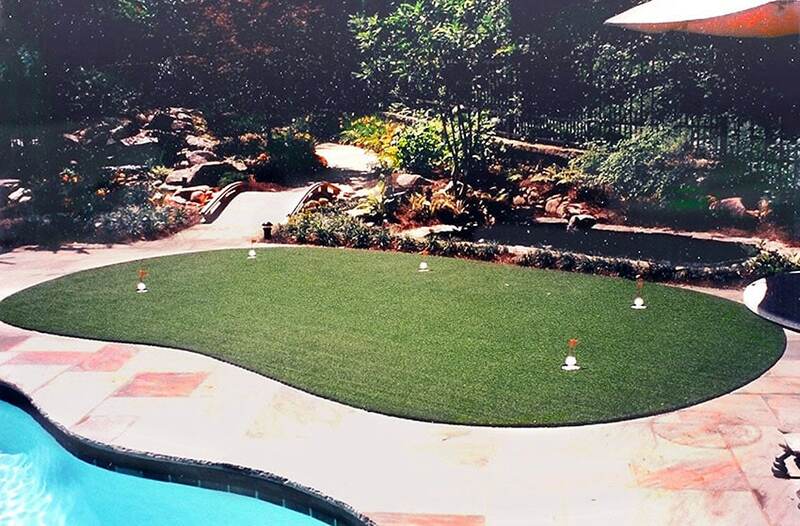 Surrounding this example of a backyard putting green is a pebbled backyard floor cover that really makes the artificial turf area look somewhat like an island in a sea. This minimalist yet still stylish outdoor design feels open and contemporary. 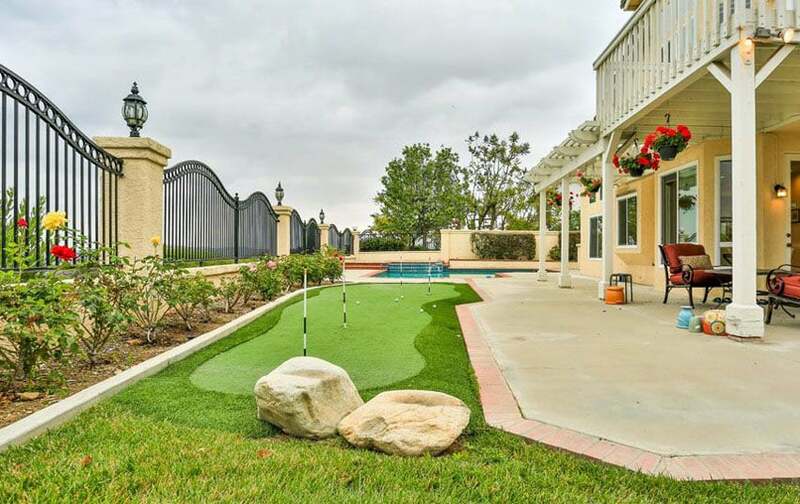 Mediterranean houses can also effortlessly sport backyard putting greens. 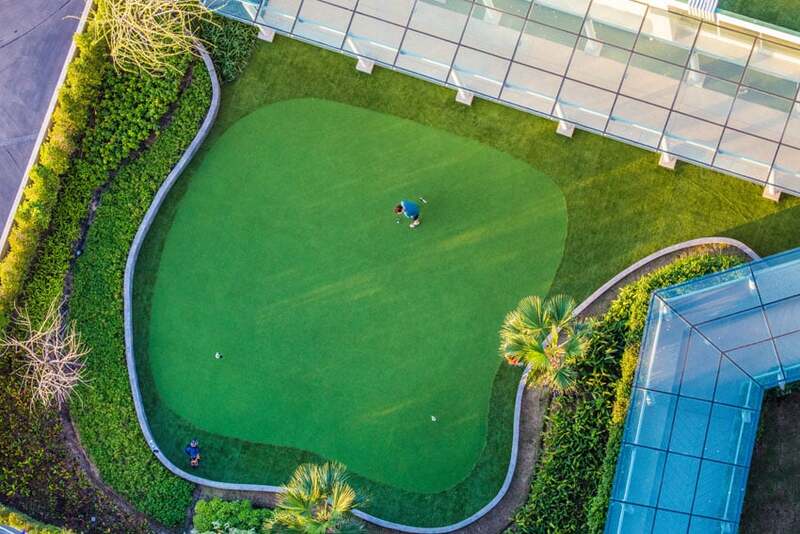 Here we see the turf working its edges around the geometric patterns of the backyard’s landscaping, creating interesting putting pockets and a more challenging way to practice your short game in golf. 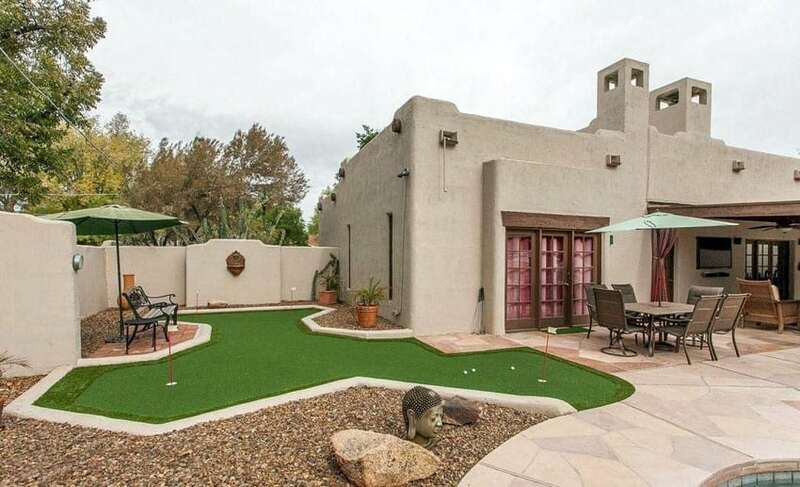 This larger backyard putting green is set in an arid and relatively dry environment which becomes somewhat apparent after noticing the many cacti and palm tree species in the backyard. But desert weather does little to hamper the passions of a true golfer. Small narrow spaces can still effectively be used to create good backyard putting greens. The design is simple and straight-forward – a rectangular turfed area with two holes to practice on. 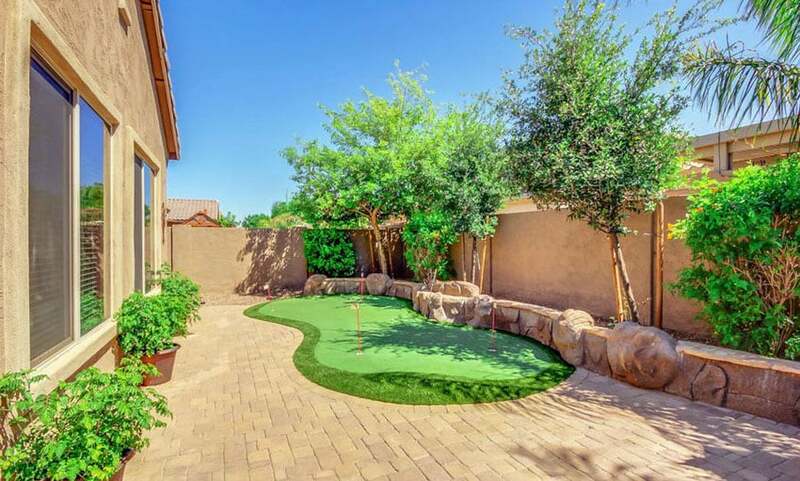 A backyard putting green such as this one is perfect for the homeowner with a quaint backyard but a large passion for golf. 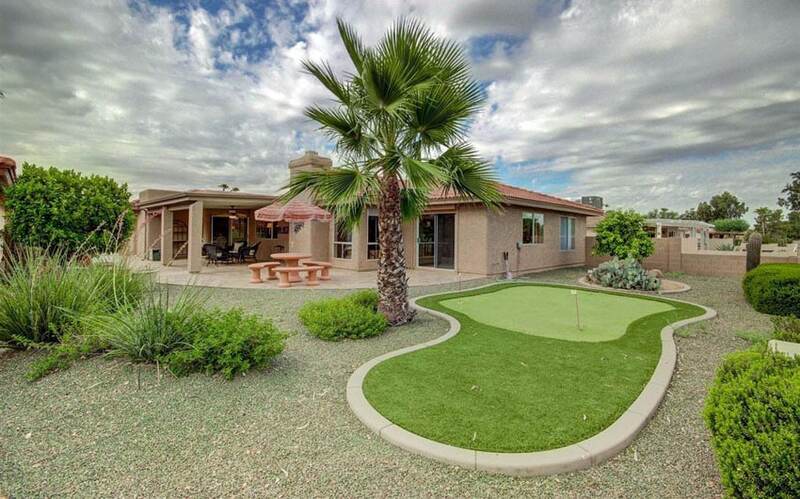 Luxury homes can afford to large sprawling putting greens and, in the case of this one, even more than one turfed areas. 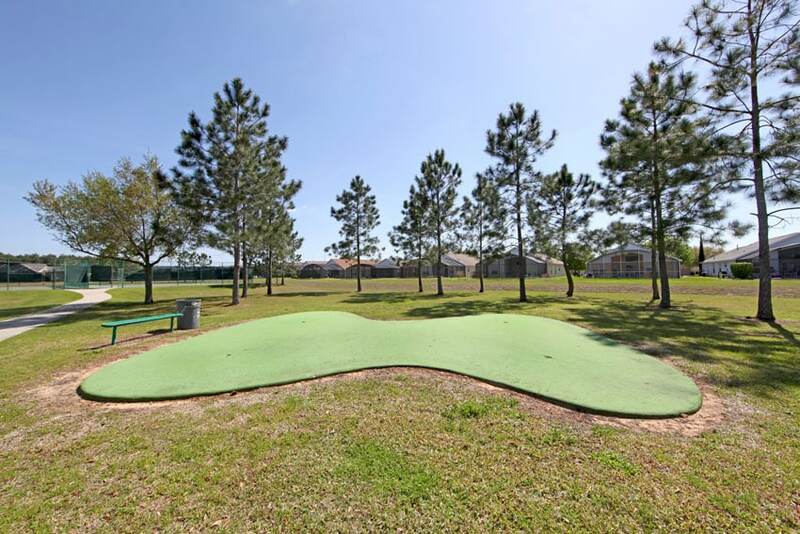 The double putting greens in this backyard can cater to more than one user at a time and with its numerous practice holes, can function effectively as a practice area for golfers. Open putting green areas can sometimes be too open in a sense that there’s not much reprieve from the heat of the sun. With usual putting practices being doing during the day time, this is often an issue. This luxury backyard integrated a tree right beside the green to provide ample shading. 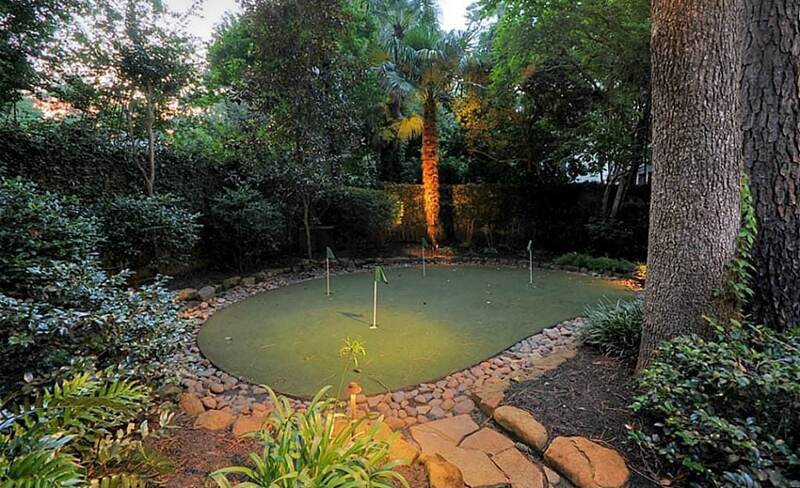 This large backyard putting green is framed by tropical plants and a block wall with stairs leading to terrace patio. Paver patios are perfect for backyard landscaping. Being able to integrate a backyard putting green into pavers is a creative way to set up a backyard and creates a nice contrast that is pleasing to the senses. 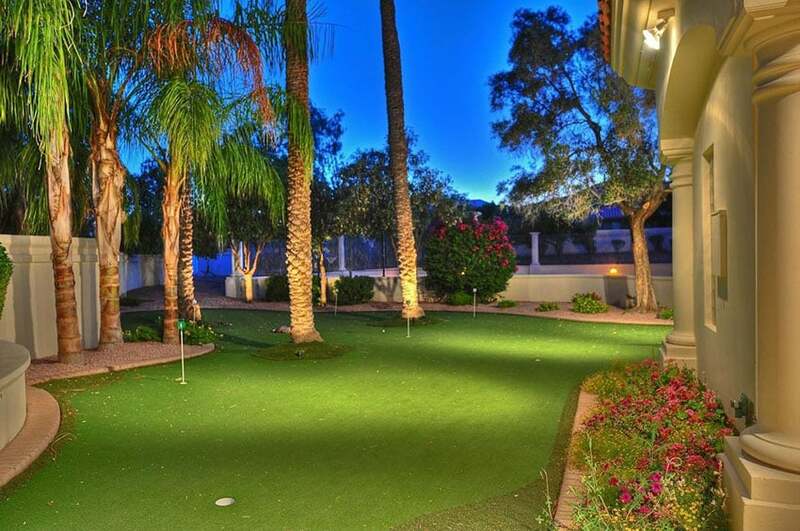 A rounded backyard putting green like this one takes advantage of the spacious backyard of this home. 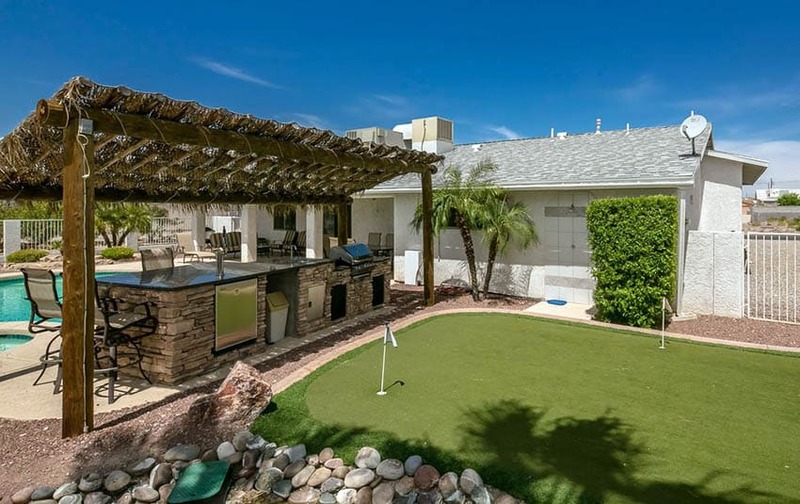 With the landscape palm tree, buses, and cacti, as well as the quaint paved patio area near the house, this backyard design uses the putting green like an accent piece and works extremely well with the aesthetic.